To write this review, I checked a copy of the book out of my local public library. Dogs are man’s best friend. We’ve reached for the tissues when reading Finding Zasha (Barrow), Cracker! : The best dog in Vietnam (Kadohata), Letters from Wolfie (Sherlock), and Eyes of the Emperor (Salisbury). In Dogs on Duty, Dorothy Hinshaw Patent goes one step further to fill us in on just how much we've depended on a dog's special senses during wartime and what it takes to turn a lovable, playful puppy into a canine commando that will faithfully serve in every branch of the military. We learn which breeds have traits best suited to the job, the training process, and the final placement as a Military Working Dog(MWD). (Not all dogs become a MWD). What do they do as a Military Working Dogs? They jump out of aircrafts and float to earth in a parachute, sniff out explosives, find hidden illegal weapons and drugs, and help find dangerous land mines. They may wear cooling vests and goggles if working in a desert, heavy assault armor for protection in battle, or booties to protect their feet from cold and ice. Small dogs are used in submarines. And when the mission is over, they comfort their handlers with a lick and a warm snuggle. The straightforward text is complimented by color photos that capture the dogs at work and play. Sidebars give more details about some special dogs. In one heartbreaking sidebar we learn about Afghanistan War Hero Hound, Eli.Eli accompanied Marine Corps LCpl. Colton Rusk in Afghanistan. While at work in a dangerous area of Afghanistan in December 2010, Colton was shot and died. The Marine Corps decided to retire Eli, even though he was only four years old, so that Colton’s family could adopt him. Eli provides a loving bridge between Colton and his grieving family. What I found hard to comprehend was the vast number of dogs used. By late 2011, United States forces had 2,700 dogs on active duty. The training facility at Lackland Air Force Base (TX)is expecting to train around five hundred dogs a year, with no end in sight. The goal of the puppy-raising program there is eventually to provide about 30 percent of US MWD’s. Where do the other dogs come from? Lackland staff travel throughout the US and Europe to find young dogs with the right traits for military careers to join the Lackland puppies for training. 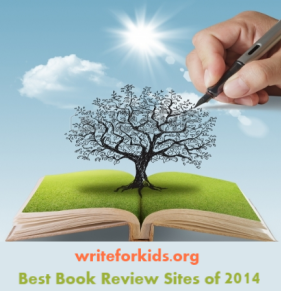 Included are websites and books for further reading, a glossary, index, and a list of sources used by the author. 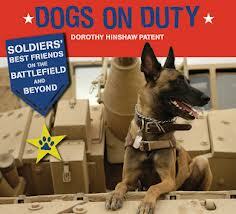 Though sobering in its subject, Dogs on Duty will complement any display about working animals or books about war.